West-end residents fear a new condo may set off "crowding" of Toronto's largest park. The boarded up houses at 1844 Bloor Street West are currently being demolished. Photo by Dean Bradley. 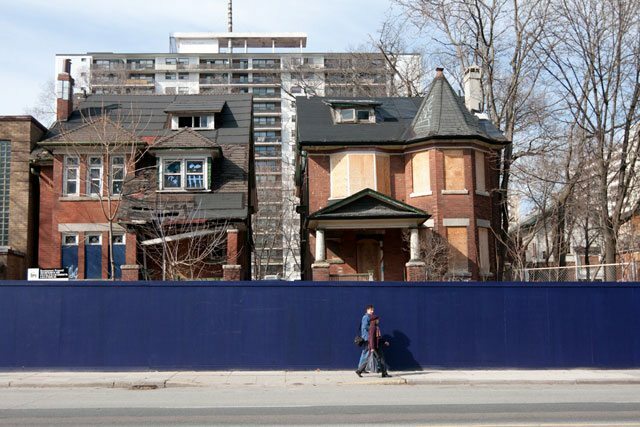 The row of boarded-up Victorian houses fronting High Park has long been an eyesore. Now though, a developer that’s looking to bring a 14-storey high-rise to the site is doing so in the face of fierce community opposition. Concerned about the design of the proposed condo at 1844 Bloor Street West, residents formed a committee dubbed “This Is My Park” in August of last year and circulated a petition that now includes over 794 signatures. E.L. Kramp, a 36-year resident of High Park and former chair of the committee, said that residents are opposed to a having a “glass-topped building” in their neighborhood, something which they just don’t think will gel with the area’s century homes. Residents are also opposed to the proposed height and size of the condo, which will span from Pacific Avenue to Oakmount Road. The current design features two eight-storey wings, with a courtyard in the middle that will be integrated into the streetscape. The 14-storey section of the building will be set back 80 feet from the curb. Kramp would prefer a five-story building at the sidewalk, stepping back to eight-storeys. The developer, Daniels Corporation, first met with the community in June of 2010 to solicit feedback for the condo design, and has held three more community consultations with the City of Toronto since then. The proposed condo at 1844 Bloor Street West. Image courtesy of Daniels Corporation. Daniels subsequently made changes to their original design, in response to City and community feedback. Daniels’ current plan includes masonry and stone in the lower portions of the building; Neil Pattison, senior manager of development at Daniels insists that the rest of the building be clad in glass to prevent the building from appearing overly heavy. Pattison may be right. 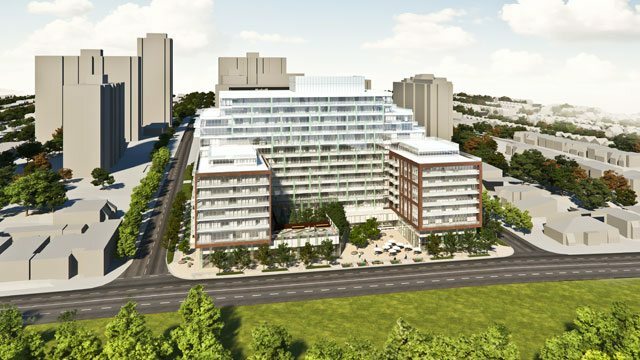 Kramp and residents are concerned that the proposed high-rise at 1844 Bloor could be precedent setting, and will result in the “crowding” of High Park. The area does already include a number of high-rise apartments, though they are set back from the park. Pattison argued that the building’s proximity to subway stations and existing infrastructure like Bloor Street is an example of sustainable design. The reality is that the City of Toronto has designated Bloor Street West as an area intended to support development and greater residential density. This may trump a recent decision by the Etobicoke York Community Council that Daniels work further with community volunteers to refine their design, and that the City report back to council on the process. In the meantime, Daniels is taking their case to the Ontario Municipal Board. A review date with the OMB is still pending.